Working with National Geographic’s team of editors, journalists, producers, and researchers, we’ve gathered this incredible footage into an engaging online narrative focused on the distinct paths that each bear roamed. 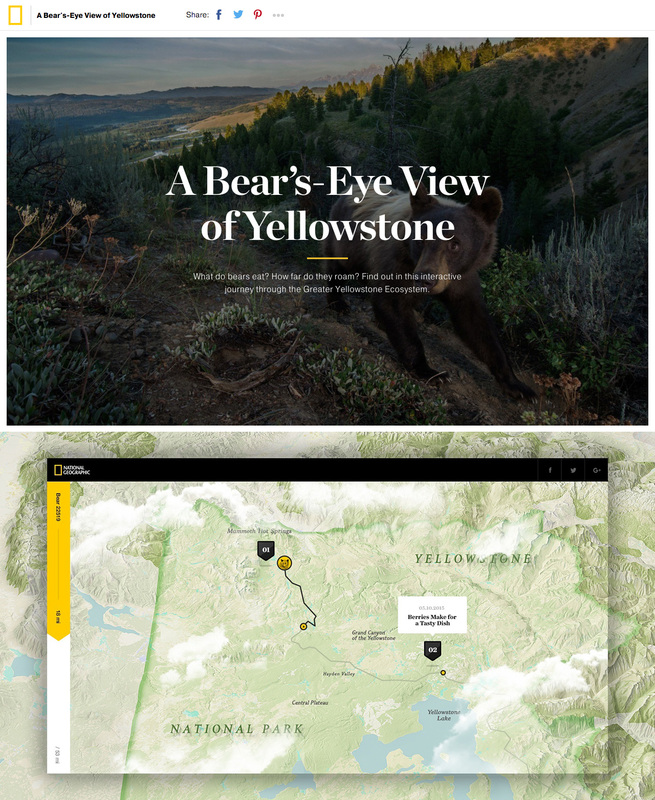 Utilizing the geo-coordinate data captured with every 20-seconds of footage, we’re able to pinpoint the bears to the exact geography of Yellowstone. Combined with expert analysis from researchers Kerry Gunther and Nate Bowers, delivered as intermittent audio captions, we gain a deeper understanding of the bears’ activity as uncovered by the POV footage and their unique characteristics. And, of course, Hello Monday couldn’t resist adding the extra hand-touch with watercolor illustrations and pencil-drawn portraits depicting the beautiful, mysterious life of each bear.